Social media has become such an integral part of our everyday lives. Sites such as Facebook provide parents the perfect opportunity to share photos of their little one with friends and family. They’re great for keeping in touch and sharing updates of your children, but how comfortable would you be if other people were sharing images of your kids online? Many parents have discovered their nanny has uploaded pictures of their children on their social media accounts. In this digital age, it isn’t surprising, but it does highlight the importance of having set rules in place for what your babysitter can and can’t share online. Some parents have even included a social media policy in their babysitting agreements. Here we’ll look at why it’s important to establish social media boundaries early on and why it matters. Why Should Social Media Boundaries Be Set? Having social media boundaries in place doesn’t just protect your child’s privacy, it also ensures your sitter isn’t distracted playing on their phones when they should be watching your child. According to a survey conducted by Care.com, 26% of parents have caught their babysitter texting, while 22% have caught them spending time on social media. While it’s safe to assume most sitters will have a social media account, it is important to have rules as to how you expect them to use it while they are looking after your little one. In terms of safety, most parents aren’t friends with their sitters on sites such as Facebook. Therefore, they don’t have access to their friends and family. Put simply, they have no idea who the pictures of their children may be exposed to. This can be very worrying. It’s one thing to choose to put images of your child onto your own account, but to have them on somebody else’s can be terrifying. It can feel like your children aren’t even safe in their own homes anymore. Some apps even link the location of the post onto a map, which is even more terrifying. Anybody could see that you’re not home and there’s only a sitter at the property. Of course, the chances of something going wrong because your sitter is using social media while they are looking after your child is extremely unlikely. However, it’s still good to have boundaries just to be on the safe side. Should You Request A Social Media Ban? The safest course of action would be to insist your babysitter doesn’t use social media at all while they are babysitting. This works largely for those who will only be babysitting for an hour or two at the most. It’s not unreasonable to request they don’t use social media during this amount of time. If they’re babysitting for a whole day however, it may be a little unreasonable to request they don’t use social media at all; especially if they’re quite young as teenagers these days practically live on social media. However, what you could request is ensuring they know not to use social media unless your child is napping. You can check whether they’re following this rule by adding them as a friend on social media accounts. This is something largely recommended to parents who use the same sitter regularly. What Rules Should Be Set? You need to think about how comfortable you are with certain things such as photo sharing. Some parents don’t mind people sharing pictures of their little ones on sites such as Facebook. However, if you do have a problem with it be sure to let them know. After all, this is your child and you’re the one who chooses what people can and can’t see. Photos Of The Child Are Allowed But Can Only Be Shared With The Parents – It’s nice to see how your little one is getting on without you, especially if you’re a first time parent. It can be stressful leaving them behind so getting a picture message through of your little one smiling can ease the worry and put a smile on your face. However, be sure to let the sitter know that any photos they do take can only be sent to you and must not be shared publicly on social media. Only Use Phones In Case Of An Emergency – You may even want to restrict their phone usage to emergency only. This is going to be a hard one to enforce as obviously you’re not there to check. However, as mentioned earlier you could always befriend the sitter on social media so you know if they’re using their phone while they’re supposed to be looking after your child. Don’t Allow Children To Look At Social Media – You may have strict rules on your children not seeing anything on social media. Toddlers obviously won’t understand what they are looking at, but they’re still likely to ask questions about it. Let the sitter know if you don’t want your toddler or child even looking at these sites. Limit Screen Time – Another thing you might want to talk about is how much screen time you’re comfortable with your toddler having. A lot of sitters give their phones and tablet devices to children to keep them quiet. While short bursts is fine, long periods of time spent staring at a screen can be harmful to your child’s development. So, talk to the sitter about how much screen time, if any, your toddler is allowed. Turn Off Location Tagging Features – If you do allow the sitter to use social media while they are looking after your child, you may still want to request they turn off the tagging feature. Many sites show the users location, either in text format, or on an actual map. This obviously presents security issues as you don’t want strangers knowing you aren’t at home. You also don’t want to risk their friends turning up unannounced. Overall, social media is something you need to think about when you’re hiring a babysitter. Keep in mind that for teenagers especially, social media is an everyday, normal thing. They don’t see it as something bad so it’s natural for them to post photos and link their location. Only by talking to them and setting boundaries right from the start can you ensure they don’t unknowingly go against your wishes. 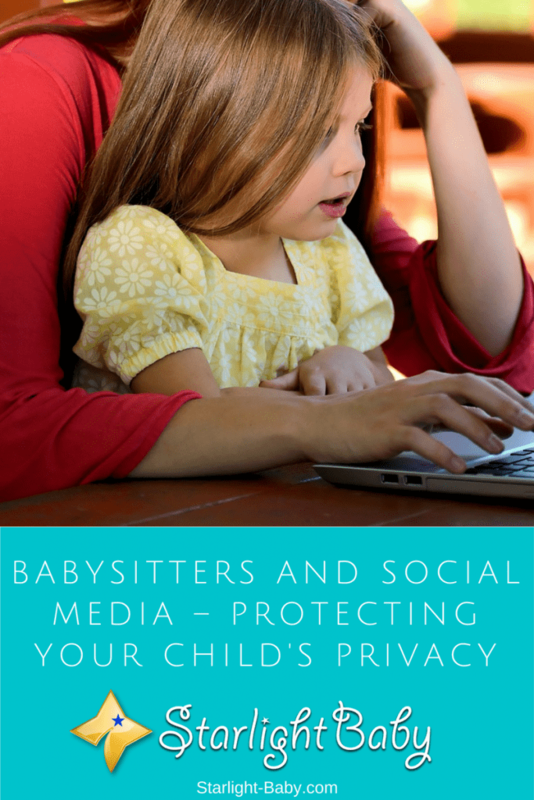 Do you set social media boundaries for your babysitters? Let us know below! Our child’s safety is of utmost importance at all times. Our baby sitters are our extensions thus, should value and take care of our children just like their own. We should set some rules and using social media is one of them. Nowadays, our babysitters are getting very young and they tend to be as techie as we are. But if Facebooking or using some media accounts can disturb them, then better tell them to just do it during night time or when you are around. I also observed some would talk endlessly with their loved ones or with friends which is very annoying. Set some rules so you will have a peaceful mind. As they say, better safe than sorry. My wife and I are currently living with my mother, When we are away for work, my mother looks after the baby. Since the baby is her own blood and bone, she is never careless. In fact, she is more careful about the baby than we are. I would never have a babysitter for my baby. I cannot trust my baby with someone who is not my close relative.